Enjoy the classic work from these masters of the bodybuilding posing platform as they elevate the art of physique display to new levels. Can you imagine a DVD with a collection of some of the best physiques and best posing routines we have ever seen?? Well, this is it!! We have researched our video archives from the last 4 years in putting together this super posing tape. It contains some segments which have never been seen before. Do not try to copy many of these routines as they may be injurious to your health! 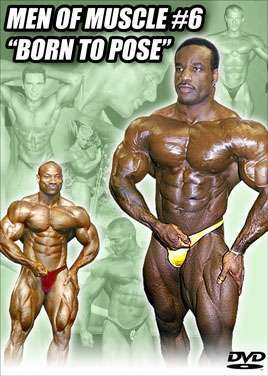 Enjoy the classic work from the following list of masters of the posing platform as they elevate the art of physique display to new levels. Also includes some brief oiling, pumping and workout segments. Photos on back cover from top to bottom: Frank Cuppens, Luis DeJesus, Stefan Havlik. A detailed review of this DVD. CRAIG TITUS v KING KAMALI in the Ultimate Posedown.